I know I say this every week, but this week really was so busy, so fun, so crazy! In my last This Week I’ve Been… post I told you that I was heading to New York for NYFW, so this week has been split between NYC and London for both Fashion Weeks, and I write this at 1am, finally in bed, ready for another 4 days of London Fashion Week! I’ll be doing another blog post for my NYFW diary (part one is here) and two posts about London Fashion Week, so keep an eye out for those! …Non stop at NYFW! From the moment we touched down on Saturday evening, it was all go in New York with Vicky! We partied til 3am on our first night, then it was show, event, work, blog, party pretty much every day! Vicky even got us on the list for the David Letterman show (a bit like the US version of Jonathan Ross) on the last day which was a welcome ‘rest’ compared to the rest of the hectic week! …Star Spotting at Tommy Hilfiger. I’d say my favourite show in New York was the #TommyFall15 show; the brand took over the Park Avenue Armoury, transforming it into a football pitch for the runway show! 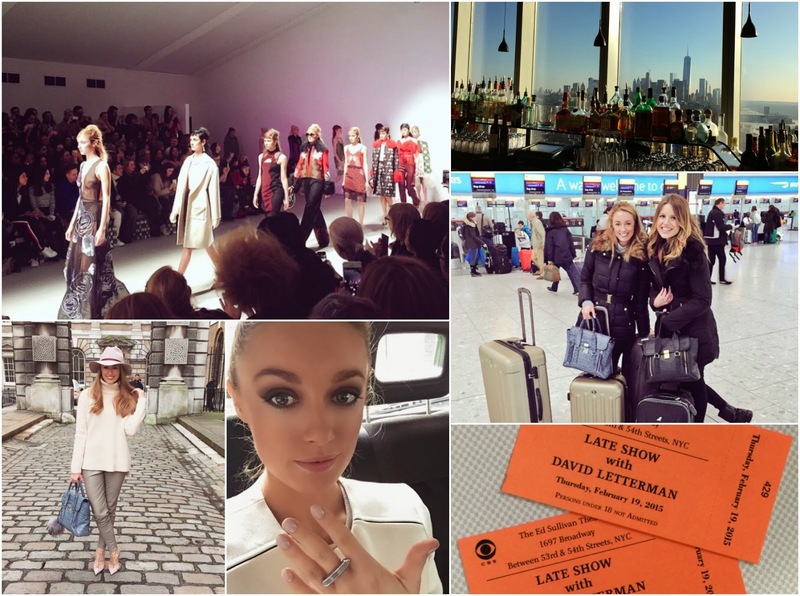 I blogged about it in more detail on my NYFW diary post here. …Experiencing the city that never sleeps! When you don’t even get to the clubs until 3am, it makes you realise how true this expression is! No amount of caffeine tablets could rescue us from getting Fashion Week Flu! Vicky and I also ate in some incredible places in NY, including Buddakan, Mercer Kitchens, Jack’s Wife Freda and Sushi Samba. …Non stop at LFW! Landing at LHR at 8am Friday morning, quick change at home then my first show at 2pm! Before that I went backstage at Felder Felder with Schwarzkopf, watching the girls get their barnets tousled and ‘sexed up’ complete with individually dyed fringes for the show. During LFW, I’m vlogging my experience for Grazia.com, so be sure to check out my posts when they’re up! … Getting pampered at LFW. Fortunately there has been some ‘me time‘ at LFW; Friday at the Ugg lounge in the ME hotel I enjoyed a fabulous back massage, and also a nail treatment from PrivUK (their app is amazing, you can get hair, makeup, nails done wherever you are!!!) before relaxing on Ugg’s super fluffy blankets with a glass of champagne in hand! Then on Saturday the day started with a manicure with NailsINC in Selfridges; when they say 15 minute speedy manicure, they mean it! I love all their new colours, and went for a lilac shade as part of their ‘The New White’ range. Still in Selfridges, I had a quick mini makeover at Charlotte Tilbury, where the lovely Katie gave me the best smoky eyes I’ve ever had, so glam!! Finally, I headed to Blo in Covent Garden for a speedy Blow Dry, Rosie gave me a natural curl; ideal for a fuss free look! … Snapping some Streetstyle at Somerset House! If you ever need outfit inspo, you just have to check out the girls (and guys!) at Somerset House during LFW. Everyone puts on their best outfits and heads there to get snapped by the street style photographers. I’ll be doing a separate post on my favourite looks. Hayley from FrockMeImFamous took some snaps of each other’s outfits, and we also got snapped by some photographers including one from Elle Romania, looks like we will be on their site tomorrow! And the fun doesn’t stop! It’s London Fashion Week til Wednesday, so keep up with the latest goings on over on my instagram, I’m @JosieLDN!